In this blog post Jean-François Therrien at Hawk Mountain Sanctuary in Pennsylvania, who has been part of Project SNOWstorm’s leadership team since our beginning, shares some exciting news about a new venture for SNOWstorm. Snowy owl enthusiasts ask the same question every summer: Where will snowy owls be breeding this year, and how good a reproductive season will it be? Indeed, because their summer diet is so specialized on one type of prey, lemmings — and because lemmings show tremendous fluctuations in numbers annually — snowy owls are known to invade a region to raise large clutches where conditions are opportune, while deserting the same region when conditions are less suitable. By June, though, reports from various places across the Arctic slowly reached us, suggesting that it was going to be a low year for lemmings — and thus for breeding snowy owls — across most of the Canadian Arctic. Our Norwegian colleagues echoed the same story. The only exciting news came from a short video displayed by the Owl Research Institute showing biologist Matt Larson at a snowy owl nest in Utqiagvik, (formerly Barrow), Alaska, where the institute’s founder and leader Denver Holt has been monitoring breeding snowy owls for 27 years. As with most research projects with a global reach, studying snowy owls has always been a partnership endeavor. Indeed, teaming up with efficient, reliable and capable colleagues and experts from around the world only increases our capacities. That is why I contacted Holt for a potential collaboration — we had the transmitters, and his team had owls. He agreed and welcomed me warmly at his study site. 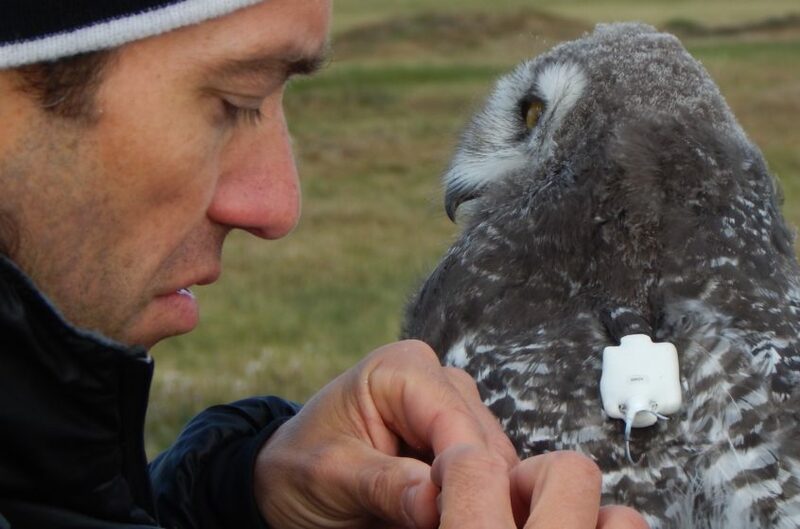 In early August, Denver and I equipped three juvenile snowy owls from as many nests with satellite transmitters on their natal grounds in Alaska. We now aim to track these birds for at least two years, and we are hoping they will provide us with new insights into their dispersal behavior from the nest site. The transmitters we are using are much smaller than we’ve ever used on snowy owls (only 17 grams including harness material, which represents less than 1% of the bird body mass) and will report their location once every 5 days. Unlike the cell-based GPS transmitters we use on adult owls, these satellite transmitters won’t need to be within range of cell tower to transmit, but they are not solar powered, so the long intervals between transmissions is a compromise to squeeze out as much battery life as we can, while keeping track of the weekly movements and survival rate. As it is the case with most raptor species, we expect the survival rate to be somewhat low in these young birds, compared with adults. But there is simply no empirical data existing on this aspect of snowy owl biology. 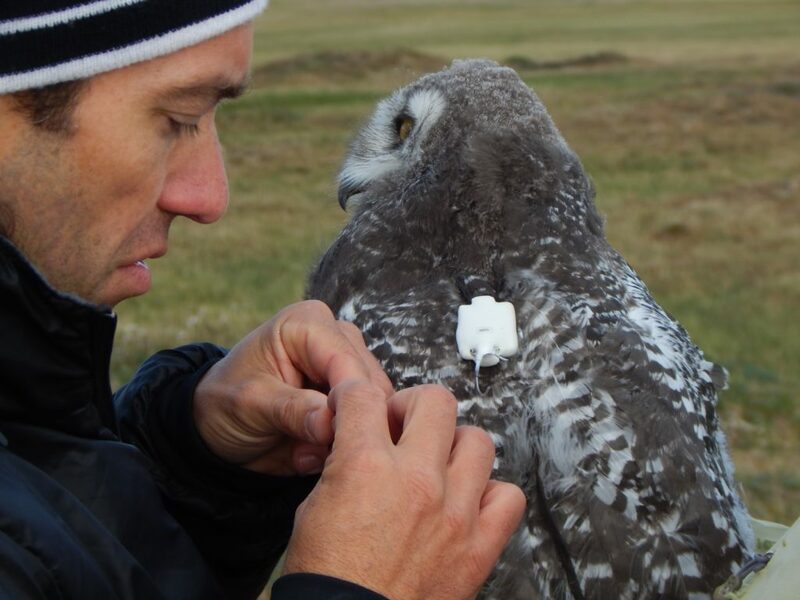 So we hope these tiny transmitters will fill a major and significant gap in knowledge of the basic ecology of snowy owls, and possibly reveal new and surprising information, but we need to bear in mind that tracking the movements of young raptors may also reveal some unfortunate endings, because young birds are vulnerable during their first year. So please join us in welcoming our three newest friends (Ookpik, Tundra, and Blanche) as we discover in almost real-time where they go and how well they make it on their own during the upcoming autumn and winter seasons. As of now, the three transmitters are working but the birds haven’t moved much from around their nests, in the northern tip of Alaska. We’ll be updating you regularly this fall about their movements. 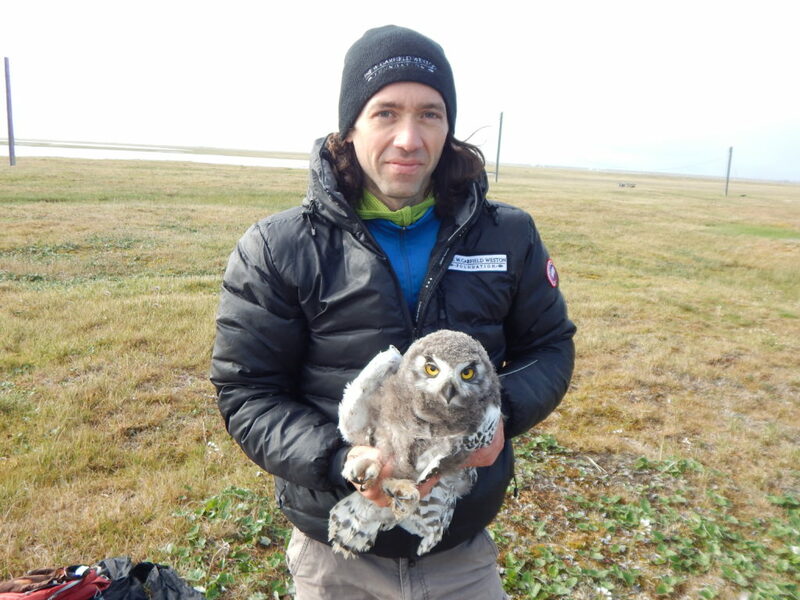 And this season was a test — depending on how we make out with these owls, we hope to tag additional juvenile snowy owls in Canada and Norway next summer, assuming the birds nest there. J.F. Therrien (Hawk Mountain Sanctuary), Denver Holt (Owl Research Institute), Scott Weidensaul, David Brinker et al. (Project SNOWstorm), Karl-Otto Jacobsen (Norwegian Institute for Nature Research), Ingar Jostein Oien and Tomas Aarvak (Norwegian Ornithological Society / Birdlife Norway), Roar Solheim (Agder Natural History Museum and Botanical Garden), Karen Wiebe (University of Saskatchewan), Nicolas Lecomte (Université de Moncton) and Gilles Gauthier (Université Laval). I look forward to “Project Snowstorm” and now this new endeavor! Good luck to the researchers and the owls! Three young snowies with transmitters, excellent news!! Love their names, especially Ookpik, very appropriate . We will be following their movements for sure!